Recent report shows that more people are traveling in the United States. One of the ways you can make money from real estate industry is through vacation rental properties. Temporarily renting out an apartment or house can offer an additional stream of income when you consistently do it. Your direct competitors are hotels and resorts, but vacation rentals offer some great benefits for people to pick them over hotels. This article also shows you why a good merchant account and payment solution is one of those key to your vacation rental success. Here are some of the common reasons why people prefer a rental property over a hotel. It’s a house, not just a room. Rental homes offer more privacy than hotel rooms. People prefer the freedom of vacation rentals over scheduled breakfasts and meal times of hotels. A great number of rental homes allow pets with renters. These are just some of the many benefits why rental properties have become such favorites for people. What Causes People to Rent Out Vacation Properties? It is wise to market your vacation rental property based on your property location or type of residence and list how it can accommodate different specific needs. Some vacation rental areas see more business executives whereas other areas are more visited by families with children. Therefore, you have to market your property accordingly. One of the ways to increase rental profit is to put your property on rent yourself. Many services can provide you the services of renting out your property, but there are pros and cons with managing the rental yourself vs. using a property management company. Here are some advantages and disadvantages of renting out your property without a middle party. You manage each and every aspect about your property and remain in complete control. The rating of a company acting as the middleman does not affect your rating. You have better control of your earnings. However, doing so has its disadvantages as well. You might not price your house right. You might not have the right tools to manage a vacation property. You don’t have a big market reach and exposure. Working with regional Travel Agency is also a great way to reduce the marketing cost and get more renter to find you offline. In addition to this, you also have to take steps to secure your vacation rental property. Here are a few things you can do. Do not take these things for granted, as you know you are advertising your property on the Internet and all kinds of people look at it. Here are some ways you can increase the profit that comes from your rental property. Rent out the property for mid to long durations despite the fact that people are looking for a daily short term vacation rental. The guest traffic is not always going to be high. Paint your property, so it looks new. Offer a variety of payment acceptance options. You don’t want to reject a potential guest only because you could not accept a payment using their preferred method, such as credit cards or ACH | eCheck. When you want to profit from a vacation rental property business, you will have to find a way to accept payments. Due to the high-risk nature of the business, banks are likely to reject your application for a merchant account. On the other hand, Moneck Payment Solutions offers credit card and ACH check payment solutions for your industry that will always help you start, maintain and grow your business despite its high-risk nature. 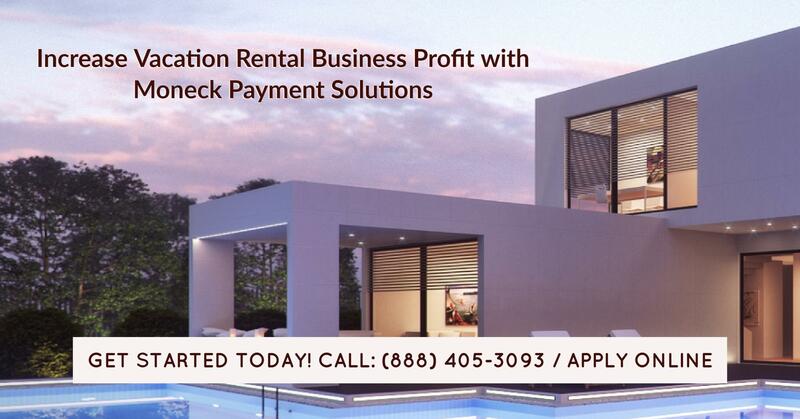 Here are some of the benefits Moneck Payment Solutions offers for a vacation rental merchant account. We have a high approval rate. We can get low, medium and high-risk merchants approved. We allow you to accept payments from all major credit cards. You can get approved despite low or poor credit score. You can process recurring payments with our account. You can also accept mobile payments. And to give you the peace of mind you deserve, we have our customer support lines opened Monday through Friday. Get in touch with us right now at 888-405-3093.